A man cools off from a public tap after filling bottles during intense hot weather in Karachi, Pakistan, June 23, 2015. An extreme heat wave that cause temperatures to soar past 43 degrees celcius in Pakistan's southwestern Sindh province has left hundreds dead, mostly in the port city of Karachi. Emergency rooms at local hospitals are full of patients suffering from heat stroke. Doctors warn that old people, those suffering with diabetes or kidney disease are particularly vulnerable. The Sindh provincial government has issued a state of medical emergency. A statement issued by the office of Pakistan Prime Minister Nawaz Sharif said the National Disaster Management Authority had been ordered to start relief measures. A relative (R) waits while volunteers search for a body of a deceased among people who died due to an intense heat wave, at Edhi Foundation morgue in Karachi, Pakistan, June 22, 2015. Anwar Kazmi, a spokesman for the Edhi Foundation, says the charity handled more than 700 bodies in its morgues or ambulances over the past six days. Kazmi said 200 Edhi Foundation ambulances have been constantly busy in Karachi, either bringing the sick to the hospital or transporting the dead. 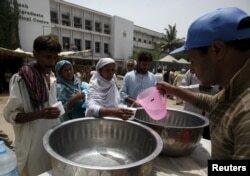 People receive drinking water from a volunteer at a stall, set up outside Jinnah Postgraduate Medical Center (JPMC) during intense hot weather in Karachi, Pakistan, June 23, 2015. Meanwhile, opposition leaders lashed out at the government and blamed the deaths on the rolling blackouts implemented due to electricity shortages. They demanded the resignation of Water and Power Minister Khwaja Asif, as well as his second in command, Abid Sher Ali. They also announced Friday would be a “day of mourning”. Asif said electricity in Karachi is provided by Karachi Electric, a private company over which the federal government has no control. 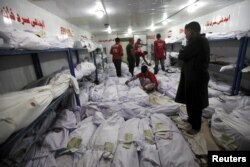 Rolling blackouts are common in Pakistan. Big cities have been experiencing seven to 10 hours of blackouts daily this summer, while in rural areas the figure is as high as 14 hours.